I have not seen a date set for the London premiere of Pirates of the Caribbean: Dead Men Tell No Tales (or as it is known in the UK Pirates of the Caribbean: Salazar’s Revenge) yet, but with the history of the series having several international premieres I would be really surprised if there isn’t one. I was actually surprised that the latest installment of the Pirates franchise wasn’t picked up for a gala premiere at Cannes, which is surprisingly devoid of any Disney flicks this season. Since my hopes of getting Keira Knightley on Croisette were smashed I am just going to have to pray that she will be an international jet setter while promoting this film. I would bet that we will see some of Keira’s variety when it comes to the more international destination premieres but the two big LA and London I have a feeling that we will see her wearing Chanel. As a longtime friend and face of the brand some of Keira’s best red carpet moments have come courtesy of the famed French couture house. 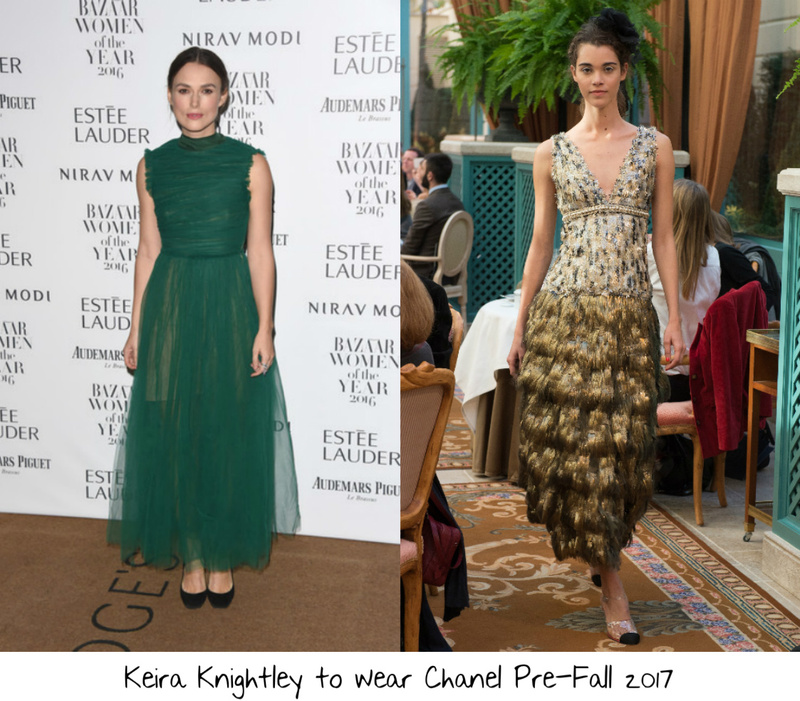 By the time that this premiere takes place Keira will have a whole new selection of looks to choose from via the Chanel Cruise 2018 collection which will be presented in Paris next Wednesday (May 3,) but there are still a bunch of looks from the Chanel Pre-Fall 2017 collection that I want to see on the red carpet. I think that this gold sequin and feather embellished midi gown from the Chanel Pre-Fall 2017 collection which features a tired skirt and a plunging neckline is right up Keira’s ally and I would really adore seeing her step onto the red carpet in London to promote this film wearing this creation. The gown is a classic style for the Chanel label, but the gold feathers and the gorgeous sequin embellishment elevate it to a true definition of modern luxury. Rounding this look with a gold headband decorated romantic updo, a red lip, red lip, diamond drop earrings, and a pair of gold sandals would just ensure that this is one of Keira’s best red carpet moments ever. I am hoping that Keira’s superstar presence doesn’t overshadow some of the rising style stars that have joined the cast of the latest installment of the Pirates of the Caribbean phenomenon. It was just recently revealed that the full original cast was going to be back for this film after Keira and Orlando Bloom were absent from the last one. So I was initially thinking that it was going to be the big moment for the films rising style stars. I hope that the presence of Keira will just inspire them to amp up their style game another notch. Iranian actress Golshifteh Farahani is making her Hollywood debut with Pirates of the Caribbean: Dead Men Tell No Tales so I am setting expectations for her style pretty high. 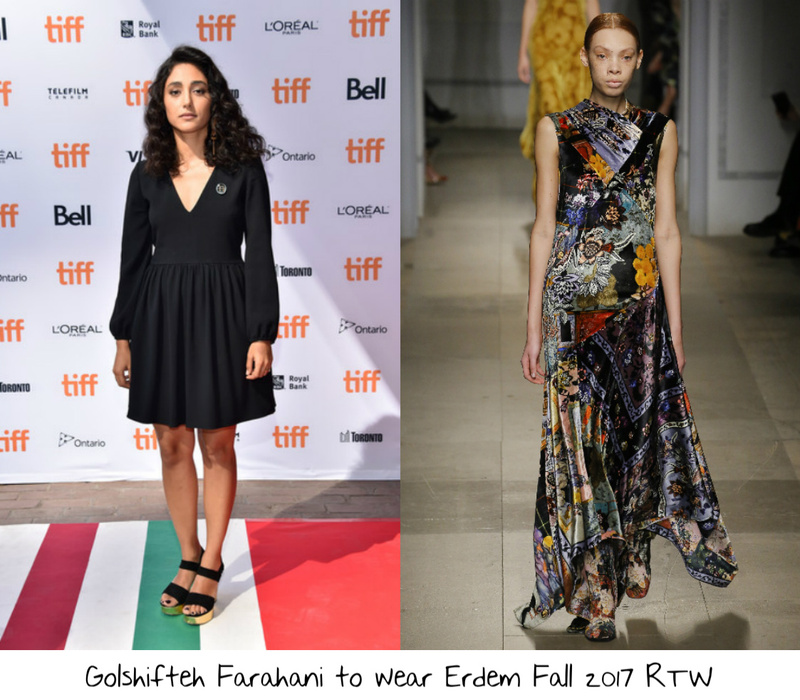 We have seen Golshifteh take to international red carpets in the past wearing labels like Valentino (both ready to wear and couture,) Chloe, and Armani. With a history like that I think that it is safe to expect something gorgeous from Golshifteh on the red carpet. I decided to expand her repertoire with this multicolored velvet Erdem Fall 2107 RTW sleeveless handkerchief gown which features a patchwork like floral print because I think that it speaks to the feel of a Pirates film, without being a costume and I do think that with her skin tone that this would just come across an effortless glam look. Because of the high neckline I would have Golshifteh style her hair into a chic updo adding a smokey eye, berry lip, and bronze sandals to really make this a gorgeous moment to help launch Golshifteh on the Hollywood scene. 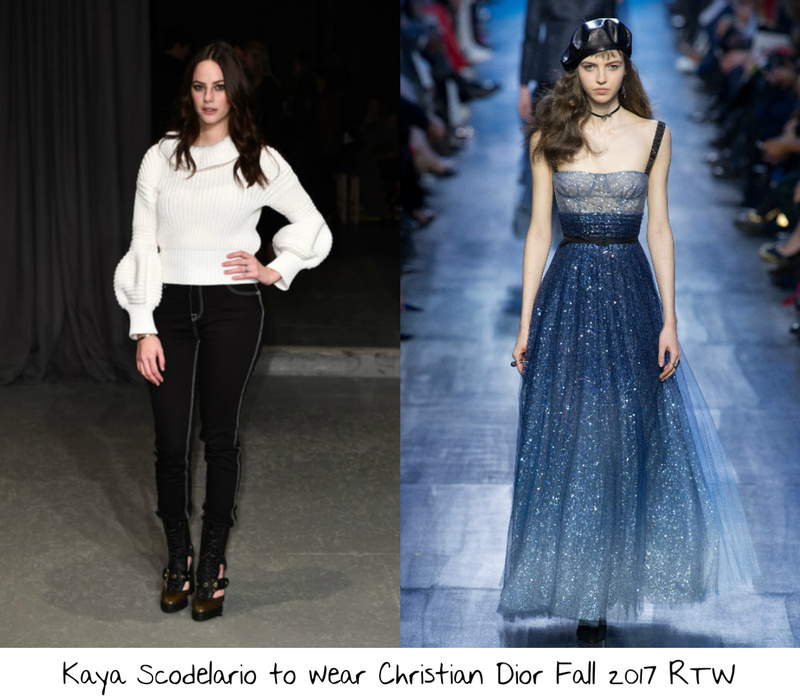 Kaya Scodelario is also a rising fashion star who seems to have caught the eyes of labels that Keira is also close with like Chanel and Burberry. I don’t see either label dressing Kaya and Keira for the same red carpets, so if Keira is wearing Chanel I can picture Kaya wearing a custom Burberry gown. I do actually think that at some point over the course of this promo tour that Kaya will wear something from both Chanel and Burberry, but I went with something very different for my wish. I was taken with this blue ombre sequined Christian Dior Fall 2017 RTW a-lined gown which features belted waistline and a subtle nod to the embellished logo straps that Maria Grazia Chiuri has made her signature at the label. The shape of this gown is something we have seen a million and a half times since Chiuri took the helm at Dior and for years before that when she was at Valentino, but the bold impact of the ombre sequins make this one look that I really do want to see on the red carpet and I do think that Kaya would look gorgeous wearing it. Finishing the look with old Hollywood waves, a pair of silver sandals, lined eye, punchy pink lip, and diamond cluster earrings would ensure that this is a look that surely stands out. Met Gala 2017: Who’s Bringing Who?